Chronic Pain sufferers usually have few options to relieve their pain. Many end up resorting to addictive narcotic pain killers and surgery, which can have significant adverse and potentially fatal side effects. Scrambler Pain Therapy is different. It’s FDA-cleared, non-invasive, and drug-free. It provides a technologically advanced and effective approach to the successful treatment of chronic neuropathic and oncologic pain. Scrambler Therapy can help patients avoid unnecessary surgery or potentially addictive drug dependence. Calmare has been successfully used with clear and immediate results for thousands of patients and pain clinics worldwide. It’s been found to be effective in the treatment of chemotherapy induced peripheral neuropathy (CIPN), drug-resistant chronic neuropathic and cancer pain, having long-lasting effects — an important benefit for both patients and their physicians. The Calmare® device, used for Scrambler Therapy in the United States, is a U.S. FDA certified pain therapy medical device for the non-invasive treatment of chronic neuropathic and oncologic pain, allowing patients to avoid the potentially harmful, addictive, and possibly fatal side effects of narcotic pain killers. Scrambler Therapy has been used to successfully treat over 4,000 patients worldwide, where it has been shown to be effective in treating neuropathic and oncologic pain. The platform is highly effective in the treatment of pain and has long-lasting effects, an important benefit for both physicians and their patients. Clinical studies have shown that this technology successfully reduces pain in more than 80 percent of treated patients without the adverse side effects commonly associated with drugs, therefore providing patients with a markedly improved quality of life. Scrambler Therapy uses a biophysical rather than a biochemical approach. A 'no-pain' message is transmitted to the nerve via disposable surface electrodes applied to the skin in the region of the patient's pain. 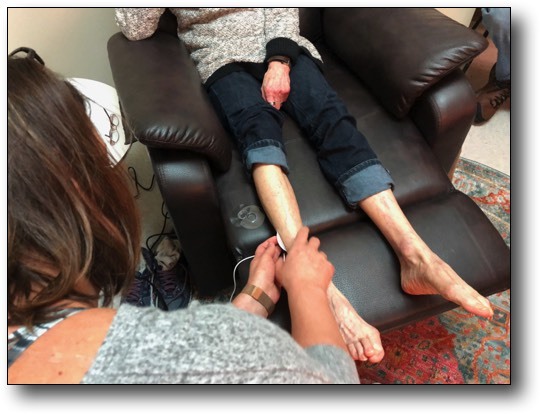 The perception of pain is cancelled when the no-pain message replaces that of pain, by using the same pathway through the surface electrodes in a non-invasive way. Regardless of pain intensity, a patient's pain can be completely removed for immediate relief. The patient may be able to go for extended periods of time between subsequent treatments while experiencing significant pain control and relief. The period between treatments depends on the underlying cause, severity of the pain, and other factors. For more information and to register for Gomez Neurology's Scrambler Therapy, click here.